In anticipation of Marc Jacobs' show this evening at 6pm (sharp! ), we've put together a helpful timeline of the beloved New York designer's most important moments through the decades. From grunge to goth to total glam, no designer has made New York a more relevant, exciting and surprising place for fashion. With no sign of letting up (or decamping like some of his contemporaries), Jacobs has a history of delivering fashion moments every season and we expect nothing less tonight! A teenage Marc Jacobs (b. 1963) snags a job as a stockboy at white hot boutique Charivari on the Upper West Side. The store's owners, the Weiser family, would also sell his knits when he was a fashion student. He graduates from the prestigious Parsons Fashion, Art & Design School where he won the coveted Designer of the Year Award. Marc shows his first collection under the Marc Jacobs label with partner Robert Duffy. After four years designing for the iconic American label Perry Ellis, Jacobs' Spring 1993 grunge collection (Christy Turlington opened) was a shot across the bow to the fashion establishment, and most critics and powers-that-be-saw it as a direct attack. 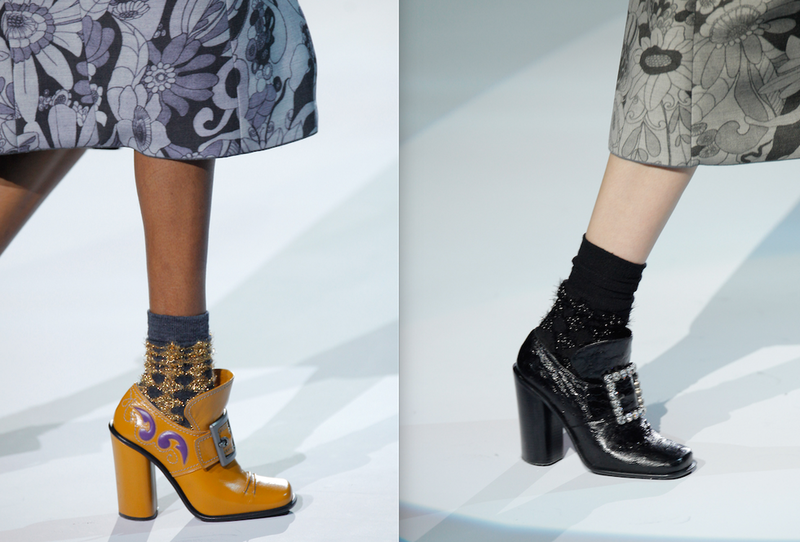 Suzy Menkes wrote that "Grunge is ghastly," and he was promptly let go from the his directorship at the brand. But they couldn't have been more wrong. It was the defining moment of his career and a bellwether moment of 90s fashion. The moment became emblematic of his instinctual and gutsy approach to fashion and has been elevated to mythical status in the pantheon of fashion history, and opened the flood gates to the prevailing mood of the decade. As a fledgling young designer, often strapped for cash, Jacobs would sometimes depend on the kindness of local billionaires for venues. In 1995 he showed at the Plaza Hotel, then owned by Donald Trump who had, at the urging of Anna Wintour, let the designer show there. Jacobs is named the Creative Director of Louis Vuitton which would become one of the most dynamic (and lucrative) "dust offs" of a European house with the appointment of a young, not-French, designer. On the Monday evening before 9/11, Marc Jacobs showed a star-studded (and, naturally, 90-minute-delayed) fashion show at Pier 54, with the Twin Towers glistening but a few hundred yards away. Glamorous, celebrity-packed and incidentally poignant (the direction was 70's flower child), the show, and party that directly followed on the water front with SJP, Monica Lewinsky, and Donald Trump to name a few, is seen in context as a tragically dazzling snapshot of life in New York before the world changed the next morning. With the infusion of capital and status via his Vuitton appointment, Jacobs & Duffy launch Marc by Marc Jacobs, a diffusion line at lower price point which would attract younger (and tbh cooler) customers to the brand, until it was dissolved in 2015. Marc Jacobs was at the forefront of the It Bag phenomenon and 2006's Stam Bag (named after aughts goddess Jessica Stam) was essentially the mascot for the whole moment. Quilted and gilted, it was the perfect reduction of the granny geek/chic that Jacobs was feeling at the moment and was boffo at the cash register. If you google any paparazzi pic from that year, this bag is in it. After years of glasses and self conscious schlub, Jacobs started wearing less and going out more. He hit the gym, dyed his hair smurf blue, and got, among others, a SpongeBob SquarePants tattoo. His Spring 2008 show was famously 2 hours late and shown in reverse, indicating that things were definitely changing chez Jacobs. Jacobs can work a theme like no other and one of the most ebullient and beloved shows recently was his 2011 ode to fashion goddess and OG stylist Grace Coddington. For his Fall 2014 collection, Jacobs cast a relative unknown (jk) Kendall Jenner in her first "Big New York Show." Whether it was a foregone conclusion that she would be a runway star is hard to say, but Jacobs' move was a signal to the industry that she was a fashion force and she's done alright since! Jacobs is a New Yorker to the core and for his Spring 2016 show he took over the soon-to-be gutted Zeigfeld Theatre in a razzle-dazzle ode to the flashy and gritty New York of yore. Beth Ditto was poured into a flowing white gown and the New York Doll's song "Trash" was blared by a big brass band. Lady Gaga made one of her most low key appearances to date in Jacobs' compelling (and mostly silent) Noh-inspired Fall 2016 show. With only the sound of an occasional ceremonial gong, the goth goddesses with plastered hair and ghostly eyes floating across a white set left attendees agog at the dark power possible in a fashion show. It is exactly the kind of unexpected poetry and spectacle that only Jacobs seems to be capable of at a moment when the relevance of a live fashion show is questioned every season.